At SIRE, we are always growing, learning and expanding our programs to best suit the needs of our clients and community members. In 2013, advanced level instructor Jen Donahue was brought into the SIRE family. 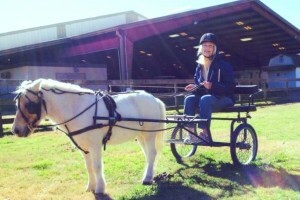 She has years of experience not only in therapeutic riding but also with driving. 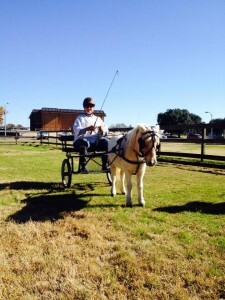 After teaching at the SIRE Fort Bend site for several months, Jen noticed how well-suited the grounds and facility were for ground work and carriage driving. Ground lessons have been taking place with SIRE’s full-sized horses and going smoothly. Also in 2013, Paige Yates, long time miniature horse owner and Katy resident, began the process at SIRE to become a certified instructor. Her experience with miniature horses, ground lessons and carriage driving fell right in with SIRE’s and Jen’s vision to expand our programs. This coming year, Jen and Paige will share their passions with Paige’s miniature horses, expanding the ground lesson program and introducing carriage driving. The benefits of carriage driving and working with miniature horses are numerous. Clients will utilize teamwork and experience a vast set of motor-sensory experiences that they might otherwise not get. When talking about the new program Jen says, “it can be very empowering to drive a vehicle attached to a thinking, breathing creature when so many of our clients will never drive a car.” In 2014, by continuing to develop and bring to the Houston community new horsemanship programs, SIRE staff, volunteers and supporters are enabling clients and horse enthusiasts to have new ways to ride beyond.